You may connect your devices to many Wi-Fi networks. You may have access to a friend’s Wi-Fi or maybe your office Wi-Fi. You cannot possibly remember all the passwords for the Wi-Fi networks your Android device was connected to. A simple method helps you see passwords for Wi-Fi networks you’ve connected your Android device. Let us learn how to see passwords for Wi-Fi networks connected on your Android device from the following article. You need to access the root files to see the passwords stored on your Android device for Wi-Fi networks. To do this, you need to download and install an app called WiFi key recovery. Once you have installed WiFi Key Recover, you need to launch it. It will as you for Superuser access. Tap on the Grant popup and you will be shown a list of Wi-Fi networks. 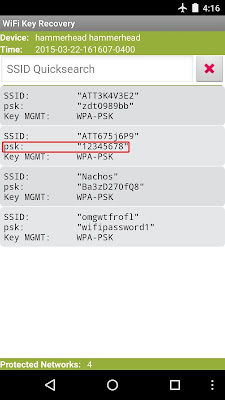 In the field of psk you can see the passwords for each and every networks you were ever connected to. You can search for a particular SSID or network name using the ‘SSID Quicksearch’ field. In case you wish to share the password, just tap on an entry and a popup will appear. Select copy password and send it as a message or you could even send it using a QR code. Similarly, you could try downloading ES File Explorer. Go to the Tools in the ES File Explorer and tap on Root Files. Here, search for DataMiscWiFi folder. Under this WiFi folder, you can search for wpa_supplicant.conf. 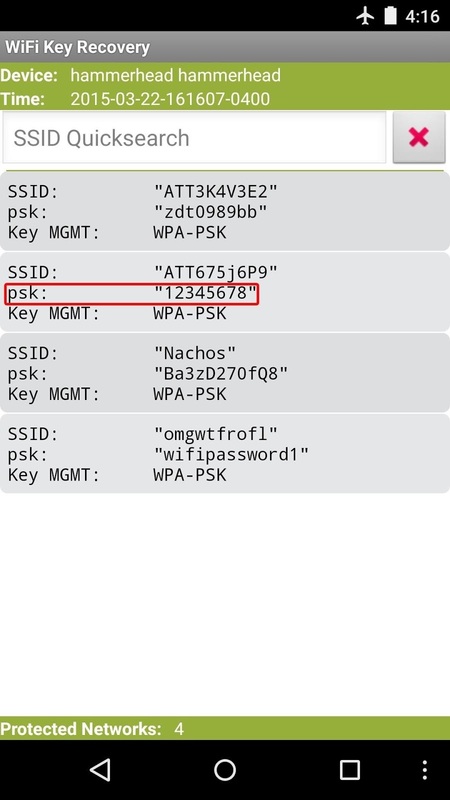 Open it using ES File Explorer’s text/HTML viewer and find the password for the SSID you are looking for. This is all you need to do to see passwords for WiFi networks you’ve connected your Android device.